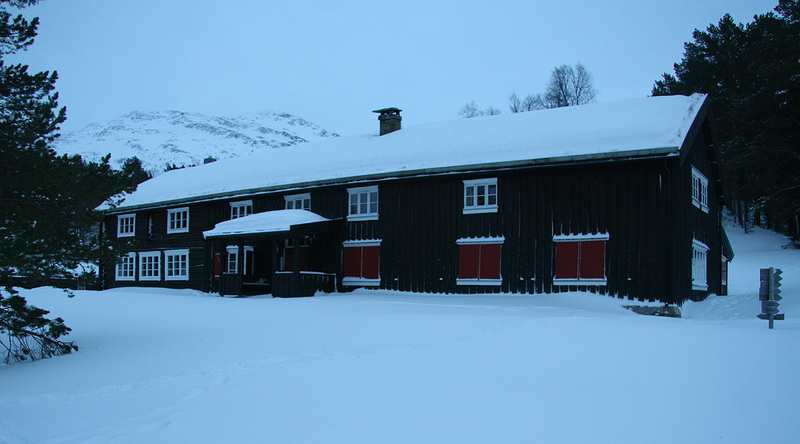 How to get there: A convenient starting point is the village Oppdal, located on Hwy. E-6, about 120 kilometer south of Trondheim. From the main intersection in Oppdal, take Hwy. 70 towards Sunndalsøra. 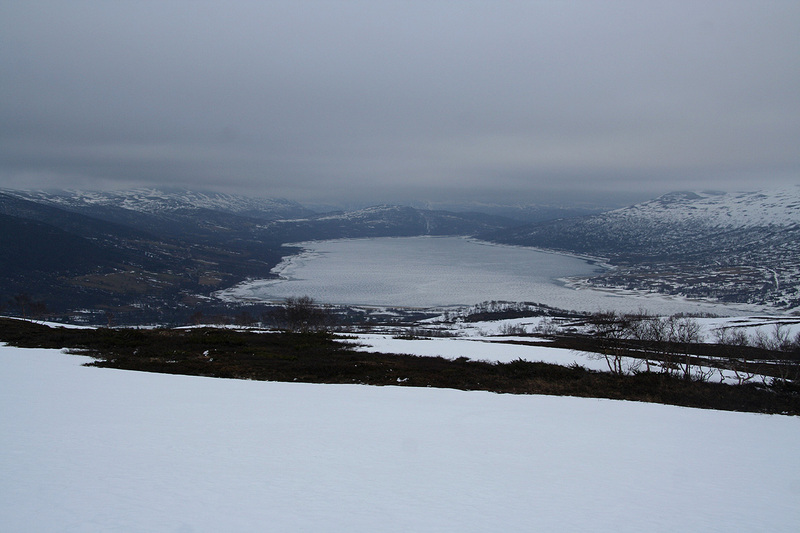 After 11.9 kilometer on this road, make a right onto a smaller road with the sign Gjevilvatnet. Measure from here. After 0.6 kilometer you must stop and pay toll at a self serve gate. The toll is NOK 40 (in 2008). The machine accepts Norwegian coins as well as credit cards. At kilometer 3.7, you are at the outlet of lake Gjevilvatnet, the road becomes a dirt road (quite ok). Continue along this road while following the lake until kilometer 11.4. You should see a three way fork ahead. The right hand road serves the DNT hut Gjevilvasshytta. This hut is a full service hut in the main season, outside of this there is a self serve quarter (no food), that is locked with the DNT standard key. Straight ahead is a parking lot, this is the trailhead, location N62:41.866, E009:25.188, elevation about 698 meter. Note that this road along lake Gjevilvatnet is closed in the winter, it was open on May 12 in 2008 (and had been open for some time by then). In summer, it may be possible to drive about one kilometer further along the road. 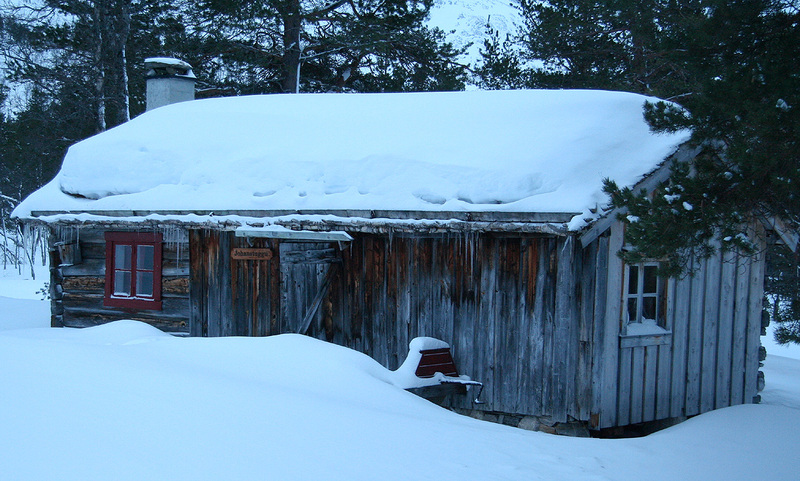 An alternative starting point from the north is the DNT hut Trollheimshytta. For more information about this see my Trollhetta report. Route description: From the trailhead, follow the paved road about one kilometer, the road changes to dirt and takes you across two small bridges to a somewhat larger open space. Pick up the trail towards your right. This trail takes you up through the birch forest. Any route will do, the forest is not too bad for skiing. Higher up, the skiing is likely better if one stays a bit to the right, ie. not too close to the gorge with the river Gravbekken that you will have on your left side. Proceed up into more open terrain. Higher up, the slope becomes almost flat. Your goal is the distinct gap between Gjevilvasskamman and Blåhøa. This gap was free from snow in May 2008, but the trail is easy to follow. 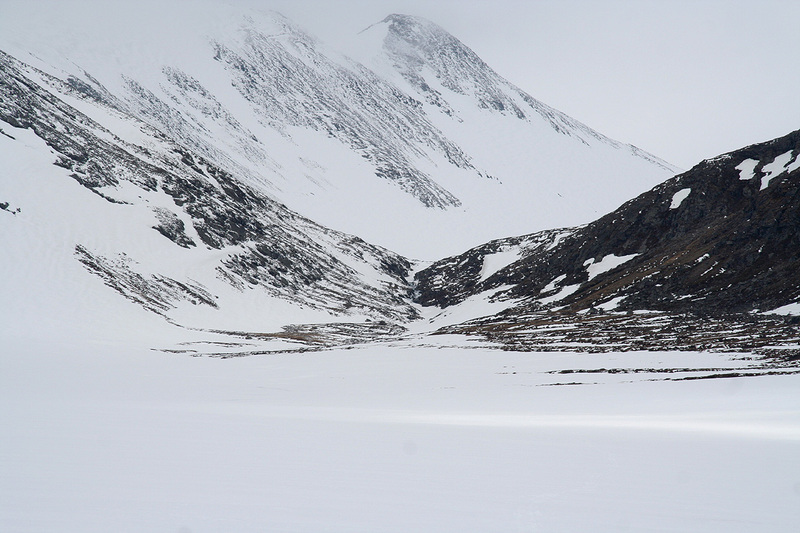 Continue on the east side of lake 1147 and up through the small col straight ahead. Continue along and somewhat above the next lake (1174), then gradually ascend the easy slope that climbs on your (east) right hand side. 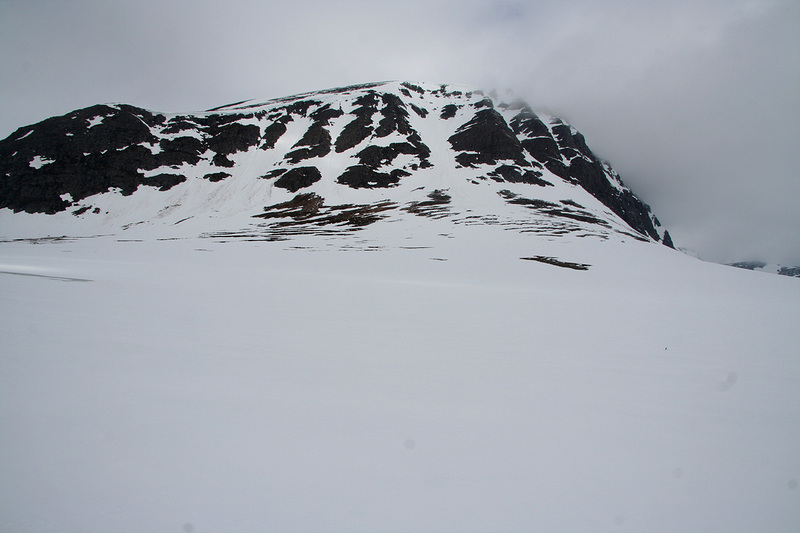 The slope quickly becomes more gentle and the route can head directly towards the summit. The cairn is located right on the brink of the steep cliffs facing east. 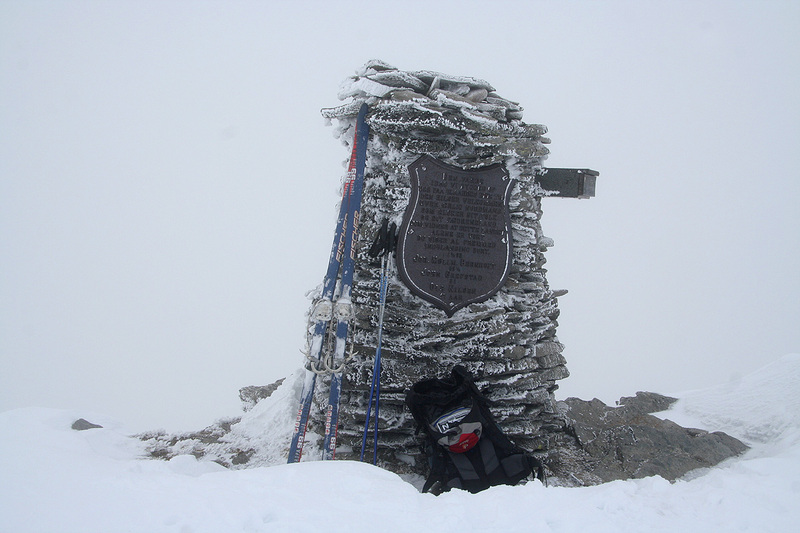 Trip report, March 17 2007: I had planned this climb for Saturday, March 17. However, it had been pretty stormy all night and the morning came with gale force wind (stiv kuling) and heavy snowdrift. I had a slim hope that the weather would improve and decided to start out. If the weather improved, I would be well on my way and this peak should be rather easy. In fact, I had rated this climb as the easiest on my three day program. First, a look around Trollheimshytta. The large building is a full serve hut during Easter and the summer season. Outside of this period, the self serve hut can be used all year. It is locked with the standard DNT key. There is also a third building, a rather old and original looking house. By inspecting the guest protocol, I had discovered that 6 men that I used to know back at NTH in the early 1970's had been visiting earlier in the month. It seemed that their stay had been longer than planned, 3 nights, most likely due to bad weather. Trollheimshytta is truly located in the heart of Trollheimen. This flat area south of the big lake must be a good place for both plants and wildlife. "The place were 7 valleys meet", said my host in Rindal. You need to look carefully to count seven, however, 5 valleys counting the lake going north as one is easily recognized. Thus, I started out around 0900 and skied south along the river Slettåa, climbing into the very distict valley Slettådalen. I had a strong wind directly from behind, reminding me that the return trip would be a very different story unless the weather changed. My hope was to get a break in the weather and then already be fairly close to the mountain. There was zero visibility and I used my GPS to locate one waypoint after another. Reaching about 900 meter with absolutely no sign of improving conditions made my choice to turn around easy. The weather was bad as I backtracked to Trollheimshytta. My route was an easy one, about 5 kilometer up a very distinct valley, no way to loose the route. I returned safely to the hut after about 4 hours of stormy weather. I started to warm the hut and had lunch as I noticed a voice. Surprisingly a couple arrived, they had set out on Friday, but did not get here before dark. They had found shelter for the night at Løsetsetra, about 3 kilometer away. After I returned to my car the next day, I learned that another skier went missing in an area not far from where I had parked my car. At this writing, he has still not been found and chances for his survival may be slim. This trip continued the next day with a successful climb of the very impressive Snota mountain. Trip report, May 13 2008: Coming from a very successful climb of Kvitingskjølen the day before, I was optimistic for another great day in the mountains. 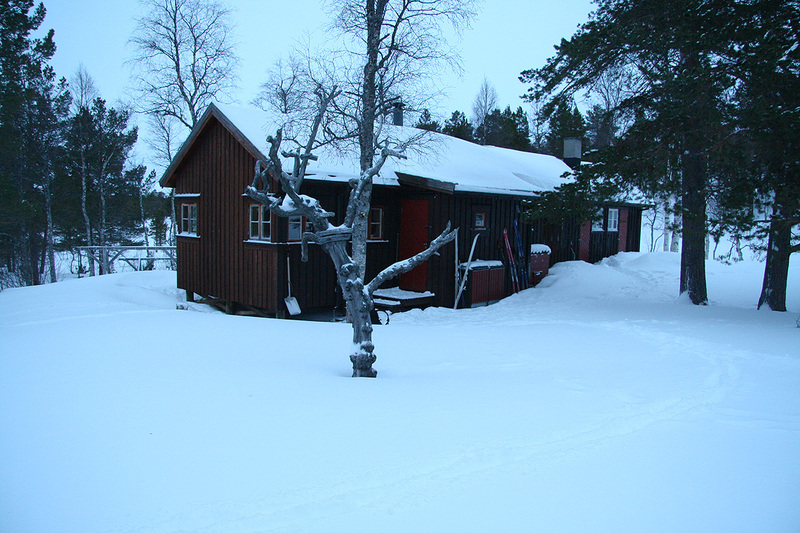 I had stayed in the self-serve quarter of Gjevilvasshytta from the previous evening. However, looking out at 0500, the sky was completely cloudy and the peaks were not visible. I had a quick breakfast, then set off on foot by 0530. Again, there was a nice transition from walking on dry ground to skiing. I skied uphill among the birch trees, avoiding the spots that were free of snow. Higher up, it clearly paid to stay further right, that is, do not follow the summer path that runs closer to the river. I crossed the river near the place where the two creeks merge, then proceeded towards the narrow gap just below lake 1147. The weather got increasingly more foggy as I gained elevation. The initial hillside slope was slightly easier than anticipated and soon I was on my last kilometer towards the summit. With very poor visibility, great care is needed when approaching this cairn. Active use of a GPS unit is almost a must. One must arrive directly from the west and not get anywhere close to the cliffs before on can actuallly see the cairn. The time was just before 0900 as I stopped at the cairn and took a look into the foggy void beyond. The cairn has a large metal plaque with an inscription. I signed the summit register, looked around and left around 0915. Skiing back down was easy and I returned for a quick lunch in the self serve cabin by 1000. 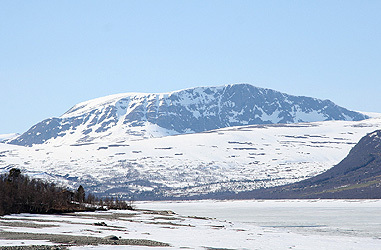 Lake Gjevilvatnet. I am gaining elevation as the trees are left behind. Blåhøa rising into the clouds on May 13, 2008. The inscription. 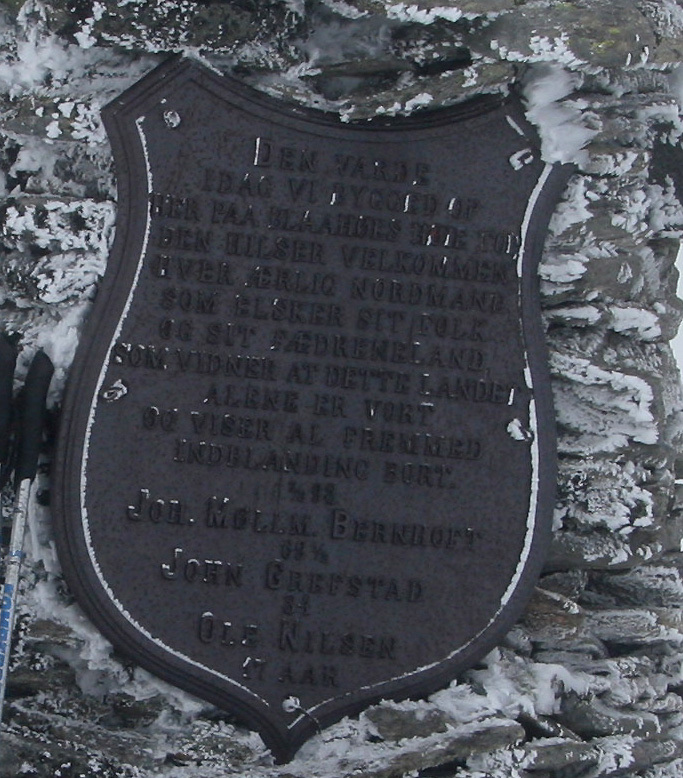 It reads: "This cairn, we have today built here on the summit of Blåhøa. It shall greet welcome every honest Norwegian who loves his people and his native country, who witness that this country is ours and who shall expel all foreign interference." The east face. 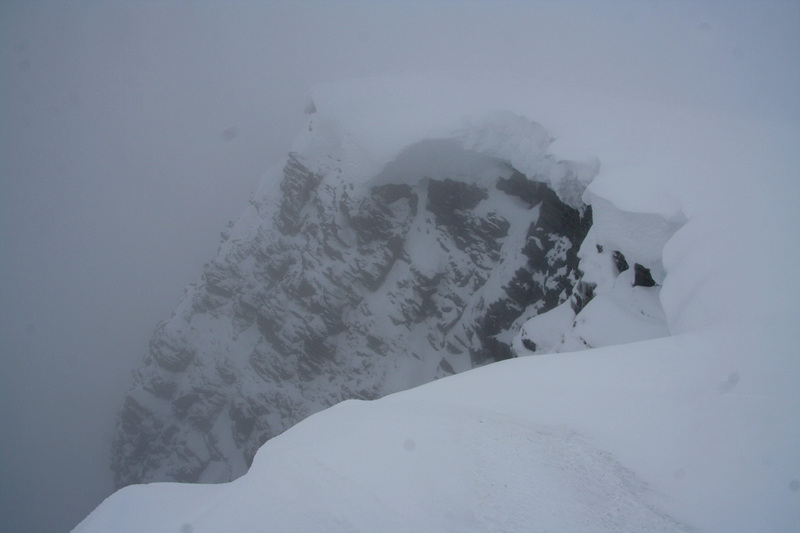 One must be extremely careful when approaching this summit in fog.